In these eco conscious times, people are becoming more and more conscious of the waste they produce and its effects on the environment. Traditional plastic grocery bags are becoming the focus of a lot of negative attention: there are billions used and discarded every day, overflowing landfills and straining the environment. 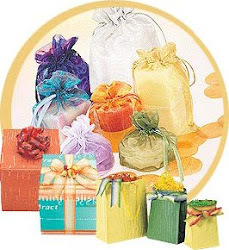 However, the plastic bag remains the most practical packaging option for a number of industries. Polyethylene plastic is cheap to produce, easy to recycle, and light to ship; from a consumer viewpoint, plastic is an attractive option as a waterproof, reusable form of packaging. The plastics industry is responding to the demand for more eco friendly options by favoring new, exciting sustainable technologies in the manufacturing process, making plastic bags easier to recycle and biodegrade. There are also a growing number of plastic-based recyclable and reusable grocery bag alternatives available. The plastic bag’s reputation is due for a positive change! 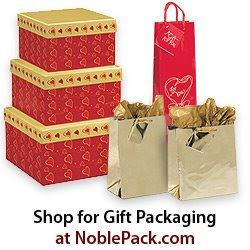 At Noble Packaging, we carry a number of environmentally friendly plastic packaging products in our Zero Tree catalog. From biodegradable shopping bags to reusable, recycled polypropylene shopping totes, we have the right bag for any use and any budget. Keep reading to learn about our line of eco friendly plastic products and to find the packaging option that’s right for you and your business! Our biodegradable plastic bags are made of high quality LDPE plastic, so they’re extremely durable and flexible during use. However, these bags quickly degrade once they are disposed of, with no harmful residues at the end of their lifecycle. When discarded into environmentally benign products, these bags degrade within a few months – this is years, even decades, faster than the average plastic bag. Even an orange peel can take up to 6 months to fully degrade; just imagine the difference that biodegradable plastics can make in the volume of consumer waste! The secret is in our addition of Totally Degradable Plastic Additives (TDPAs) to the bags in the manufacturing process. TDPAs are an EPI certified technology which enables certain plastics to much more rapidly. Biodegradable bags are a sustainable, environmentally friendly alternative to the traditional grocery bag – this sends the right message to customers by demonstrating your commitment to the environment and to the earth. For more information on biodegradable plastic bags and TDPA technology, click here! 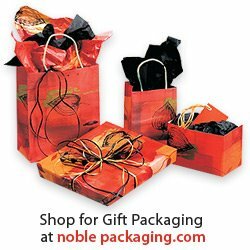 Noble’s PET line of bags is another great environmentally friendly choice: they’re made from 100% recycled plastic bottles. PET fibers begin as crushed plastic chips from recycled plastic bottles – these chips are heated, stretched into threads, and then woven into the material that constitutes our bags. The result is a durable, recyclable fabric that has the same look and feel as fabric. Not only are our PET bags made of 100% recycled material; one reusable PET shopping tote can replace a multitude of traditional plastic bags! Reusable bags like this are also a great branding opportunity – your customers will think of you every time they use your silk screened tote! Finally, our non-woven fabric bags are great reusable alternative to the much-maligned plastic grocery bag. Made of recycled polypropylene, these bags are 100% recyclable and biodegradable! Like our PET bottle bags, these make great reusable shopping totes with the same look and feel as cloth. Recycled polypropylene bags are an excellent replacement for plastic shopping bags and a greener alternative to other cloth totes. They’re also a much more affordable choice than most reusable shopping tote options, which is something you and your customers can feel good about! So there you have it: plastic packaging products that are sustainable, reusable, eco friendly, and economical. There are a lot of great new environmentally friendly options and alternatives in the packaging industry, and we’re here to help you learn about them! If you have any questions about any of these products, never hesitate to contact the Noble offices – we are here to help you make the right choices for you, for your customers, and for the environment. Gifteveryone.com provides better plastic bags for every occasion of high quality and cheaper ones too. You also get a lot of discounts while purchasing through GiftEveryOne.com. It is very good to have a packaging on the food products but make sure whatever packaged food products you are getting should be a real weight age one as you are demanding. So make sure before buying that you are getting the right packaging material. Although plastic bags are sustainable, I'm highly suggest use biodegradable materials or cardboard in gift packaging design. Very nice! Thanks for sharing such creative and good post. I am impressed with the research you made to make this article awesome. These bags are strong, durable and can be recycled. Plastic has been an integral part of modern life for several decades. It is a great thing that the plastic bags are used not only to save the environment but, they are also used to pack different materials. Good article about sustainable plastic bags. I really like how you explained about the uses of bags and their variety. I want to show you sandbags for sale where you can have a look to variety of eco-friendly bags.